You are here: Home / Health / First Aid Kit Preparedness for March Break & Beyond! 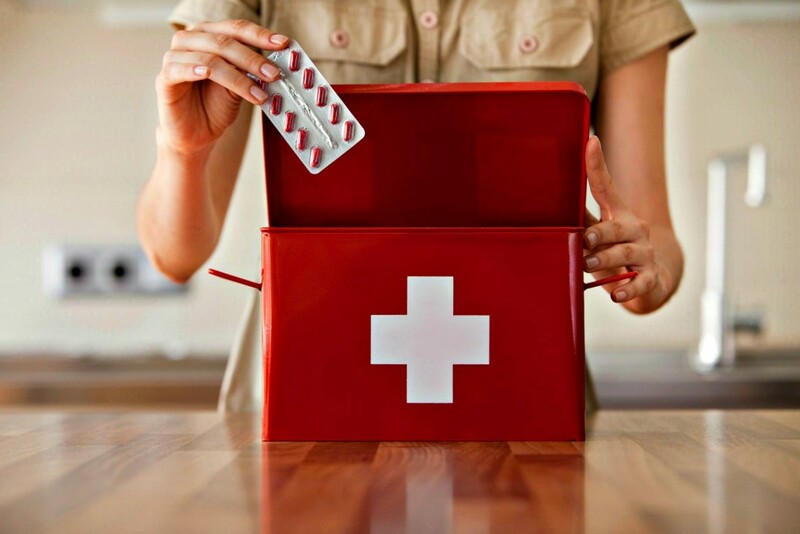 First Aid Kit Preparedness for March Break and Beyond! If you’re heading out and going abroad this March Break, being prepared is absolutely essential. Moms don’t usually get a break during vacations and that’s why it is always good to plan ahead and anticipate any bumps you may face on the road. By doing so, you’ll be able to relax and attack any problem that may arise! In the instance that you’ve booked a week on a beach resort where you will enjoy turquoise waters and white sands; or if you are going to be taking on Disney World. In fact, you may even be going to colder climates and taking an Alaskan cruise. Whatever it is, March Break is a perfect time to get away and make memories. Doesn’t it always seem that kids are prone to hurting themselves or getting sick when you are abroad? It does happen more often than we’d like. I am a big believer in prevention but, it is often out of our control. Having a well-stocked First Aid Kit is absolutely essential. All you have to do is make sure that it is fully stocked and pack it into a carry-on for in-flight emergencies and your checked bag. Most hotels and resorts have first aid kits available but, having yours at the ready saves a lot of time for minor accidents or illnesses. You can get back to your vacation in no time! Calibrated spoon to administer meds. Cotton balls and cotton-tipped swabs. Children’s BENADRYL® Liquid for allergic reactions. BENADRYL® Itch Spray for bites. Hydrogen peroxide to disinfect cuts and scrapes. This is a list that I’ve compiled of the absolute essentials. By all means, feel free to add to it if you have something that you think you need. I’ve also made a handy and FREE PRINTABLE for you to use as a checklist. That way you know that you are first aid kit prepared! * Certain cough & cold medications contain the same medicine as BENADRYL®. Always make sure to check the label and use only 1 product containing diphenhydramine at a time. Even if you aren’t traveling this March Break and staying close to home, it’s always a great idea to have a fully-stocked First Aid Kit at home, in the cottage and in your car. That way, you’re always prepared for anything unexpected! Bringing along BENADRYL® for your family while traveling will help relieve sneezing, runny noses, itchy, watery eyes, and hives. New environments and situations can cause unexpected allergic reactions. Depending on the time of the year or where you’ve traveled to, you definitely want to have the BENADRYL® Itch Spray on hand. It will help with unexpected allergic reactions, poison ivy, insect bites, mild sunburn or skin irritations. Since you spray it on, you have a topical analgesic that will quickly and effectively provide relief. Did you know that Canadian travelers have voted BENADRYL® as their favourite brand for Allergy Medicine in the 2016 TripAdvisor’s Travelers’ Choice Awards? TripAdvisor surveyed thousands of travelers around the world about their favorite brands and BENADRYL® is one that they prefer to have with them on a trip. I know I do! For more information about BENADRYL® products, head over to www.benadryl.ca! Whether you are heading off for March Break or if you’re staying home, make sure to give your First Aid Kit a check-up. Check for expired products and replace them or add list items you may be missing. Read and submit your own product review of BENADRYL® on Bazaarvoice! How are you always prepared for the unexpected? This post was sponsored by the makers of BENADRYL®. Thoughts and opinions are my own. This post should not be used to diagnose your allergy symptoms, or the cause of them. Seek a health care professional if you experience any signs or symptoms of an allergic reaction, and always read and follow the label. Previous Post: « Do You Know Your Cancer IQ? Learn Your Cancer Risk and How You Can Lower It. Hehe, use the checklist–it may help! My recent post Prediabetes – Are you at risk for it? We have an emergency food supply we always have to rotate, but I never think about rotating the products in my first-aid kit, so that's a really good idea. And keeping a supply of Benadryl in there is a really good idea, too. Have a good first aid kit is essential when you have kids round. I swear, mine always seemed to be getting injured somehow. LOL, it happens a lot here too. With four kids including toddlers, I try to always prepare. First aid kit, hydration kit, and a charged phone are always a must when I leave the house! What a great list of must-haves for 1st aid. I would never have thought about including a thermometer, LOL… Oh and Benadryl is always a must . Thanks so much for sharing. My pleasure, hope it helps! Love this list for a first aid kit!! I have several kits around our house we are all so accident prone, and we have one in the car as well. Always great to have on hand and this is a perfect time to check if you are low on things or if some have expired! I love benadryl. Such great stuff. The summer time we had some bee stings that were terrible that we needed benadryl for and it worked so quickly. One thing I don't have is aloe vera, I recall growing up my Gram had an aloe vera plant and it was great for burns! I will have to get a first aid kit ready for these rough n tumble boys of mine now that they will be heading outside more often with warm weather hitting us in NH. Always a great time to stock up and get things you missed! This is a perfect kit to have in emergency backpacks. It's a great list and I love your printable!! Benadryl is a staple in my house. I'm allergic to bees! My recent post Here’s a Big Shout Out to the Girl Scout Koolaid Gang!! Thanks so much, hope it helps! Also, definitely a good idea to have it around if you are allergic. It is so important to have a well stocked first aid kit in the house. I am making one for my car this weekend. A first aid kit is something you never seem to think about until you need it. Umm…kinda late then! When you are travelling (especially with kids!) this is an important thing to remember. Yes, so very important and unfortunately you are right. Always good to be prepared! You have to be prepared! You never know when you'll need your first aid kit! A flashlight is genius! I would have never thought of throwing that in my first aid kit! YES! This kit would be so helpful when my family takes trips. My kids seems to get hurt all the time! Love this ! Such a great list of things to put together and have on hand if needed ! Thanks, I think it is always good to have. Reading this post reminds me its time to update my in home first-Aid kit. Great tips ! It is so smart to have a first aid kit and have it stocked at all times. Especially when you have kids. 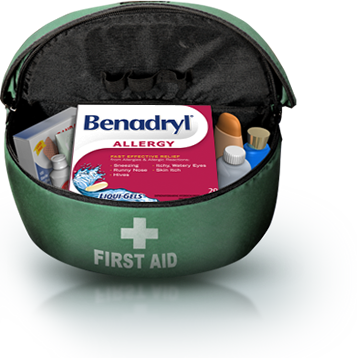 I keep Benadryl in my first aid kit at all times. It's great for almost any sort of mild allergy related issues. I so need to update my first aid kit! I've taken stuff out here and there and seeing you list, I know it's missing a few essentials! I have all of these items on hand in our house. But I also carry a first aid kit with all the essentials in my truck at all times. Man, I don't even have a first aid kit in my house. I should really get one! Wow! That is a comprehensive first aid kit!! Thank you so much for putting that all together for us! I will be printing. Thanks for using the printable, hope it helps. This is a great first aid kit. I will have to stock up on the items on the list for my house. With two very active little girls, I always have to be prepared. I have most of your items in my kit. This is such a great post. It is so incredibly important to be prepared, especially now that I am a mom and have two little boys to take care of. Thanks for the reminder to stock my first aid kit. I can say that I'm always prepared. As a Girl Scout should be. 🙂 I always make sure to bring a first aid kit when we travel. LOL, that is awesome. Definitely need to be prepared. And they always happen so unexpectedly! This is a great list of products for the kit. I need to get a first aid kit together. I would like to keep on in my car at all times. I think it would be great to have on hand. Yes, especially in the car. You just never know! Always great to stock up. I was thinking of making one for our family and each of my kids. Always great to have, hope the list helps. I have checked our first aid kit in forever. I must update it. Yes, always a good idea to check it. I always have Benadryl at home! I also have a first aid kit, because you never know…..
Do not forget to check for expiration! LOL, same here. Always prepared! It's always a great idea to have a first aid kit when you are away from home. Thanks for sharing these tips! My recent post Say Something! My pleasure, hope they help. We've one for the house, another for the car! Always great to be prepared! Great list but I also make sure to Adult Benadryl in the kit too. I need to restock ours. It is always good to go through and check! Hehe, always good to check! That is awesome! Glad it helped!